We have had a lot of stops and starts in the past two weeks! After a long winter holiday break the children were just settling back into a school routine….then it snowed! We had a long weekend with school closings and delays. I thought it would be fun to talk about ice and how it melts. First we had a big discussion of ice and snow and where it comes from. Then we talked about why were haven’t been able to come to school these past few days. Lastly the children hypothesized what they could do to melt the huge ice blocks in the art studio. They got right to work exploring the materials and seeing how they could free the animals from the ice! I set up a large table with two blocks of ice, salt, and a variety of watercolors. They could use small or large water droppers to put the watercolors on the ice. how to squeeze the dropper was a BIG topic of discussion! 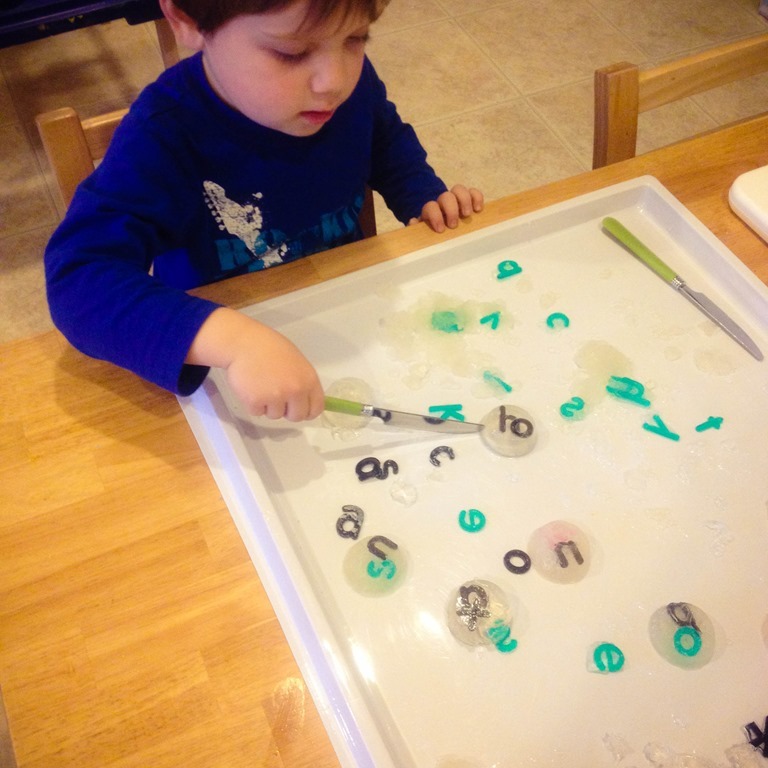 The dropper takes a lot of coordination, fine motor ability, and hand/eye coordination. Many children struggled with the droppers, but they were so interested in the ice that they kept with it until they mastered the skill! For this science experiment, the children then came back to the carpet and drew pictures in their learning journals of the changes to the ice! I will share some of their drawings next post. By Friday morning we had melted and refroze our ice all week long, but it still wasn’t completely melted. So we took the ice outside to see what the warmer temps and some hammers would do to the ice! Categories: early childhood education, preschool science | Tags: hands on learning, ice, learning through doing, learnning through play, melting ice, preschool science, snow | Permalink. We had a fun week waiting around for those silly leprechauns to visit Crozet PlaySchool! Even though our main focus these past two months has been all about animals, I added some colors, rainbows, and a few science projects to go along with St. Patrick’s Day! The picture above shows a simple Rainbow Stain glass window project we made. Each student got their own window with lines, and then they added the colors of the rainbow using tissue paper. The final results were so fun to see, and they made our classroom entrance really colorful! A is working on laying out her green pieces into the frame. Even our youngest friends enjoyed this art project! The picture below showed how beautiful the rainbows looked with the sun shining through our doors. Another very rainbow inspired project was our glue sun catchers. The picture below shows H squeezing the glue into his lid, and a crowd gathered around him to see exactly how this project was going to unfold. Once we filled our lid with glue (and for many of us this was very fun to squeeeeeze out so much glue! ), then we added a few drops of food coloring. We found out the hard way that if your added too many colors of glue it would get very muddy. Two colors seemed to work the best! Then we mixed the food colors using a toothpick. These are pictures of our rainbow lids drying on the windowsill. Aren’t they amazing? Once the glue dried, I peeled the glue out of the lid, punched a hole in the top, and hung them with a fishing wire. First we filled milk in the lid, added two different colors of food coloring. Just a few drops! Lastly we dipped our Q-tip in Dawn dish soap, and placed it right in the center of the milk. The kids were really impressed with the magic of the milk! The best part was watching each friend getting a chance to try the magic milk experiment! For St. Patrick’s Day we had to make some Shamrocks too! We covered a tray with white shaving cream, dropped two different shades of green into the cream, swirled, and squished the paper shamrocks into the cream. Such a fun a messy project! Categories: early childhood education, holidays | Tags: colors, exploring colors, learnning through play, play based preschool, preschool crafts, preschool science, process art, rainbows, reggio inspired, science, science experiments, sensory play, st. patrick's day | Permalink. Our beautiful classroom got a much needed face lift and I took some time to rearrange a ton of furniture in the room. Many of the children have been building lots of building, ramps, moving the tubes around, and I felt they just plain needed more building space. I moved around my train table area and brought out both of the wooden platforms that I have for building. I also moved the projector out the light area to add another element to the building environment. It didn’t take them long to start exploring our new area! B got busy moving around the color paddles to see how they looked projected around the room. It didn’t take long before B had an audience to see how they colors looked when they were manipulated on the overhead projector. The light also provided a very soft glow that made it the perfect spot for building. I love seeing the whole group working on a building together. Above they made a large building with the unit blocks, LED candles, and the large animals. They spent a great deal of time here during the morning. After the next few days I added translucent letters to the overhead projector, and it was interesting to see how the letters added a new level of play to the projector. Immediately they loved to see all of the letters on the ceiling. Each child wanted to see “their letter” on the ceiling. As soon as their letter was projected they would climb up to the loft to touch their letter on the ceiling. After we explored the letters on the overhead for a few days, we also explored the letters in our names using paper and pencil. These little crayons the kids are using are called “flip crayons.” They are purposely made very short and encourage the correct pencil grip when children are using them. We made these name puzzles by cutting strips of paper and using one piece per each letter in their name. Each child they wrote their letters down the strip of paper as many times as they could to practice their letters. Once they were finished we mixed up the pieces and they put their names back together again. It was neat to see children’s names start to appear all around the room in different places. Categories: early childhood education, preschool literacy, Uncategorized | Tags: block play, classroom as the third teacher, classroom environment, learnning through play, light and shadow, light and shadow project, overhead projector, play based learning, play based preschool, playmatters, reggio emilia, reggio inspired | Permalink. We have jumped back into January with a bang! We picked up where we left off in December discussing our letters. Each morning we continue to read a book associated with the letter we are concentrating on that day. After talking about the way the letter is formed, we will look inside of our sound box and see what items represent that letter’s sound. I have also been trying to incorporate a whole language letter approach into lots of other parts of our morning activities. The picture above shows one of the games we played at morning meeting last week. I had post-it notes with upper and lower case letters on the ground. 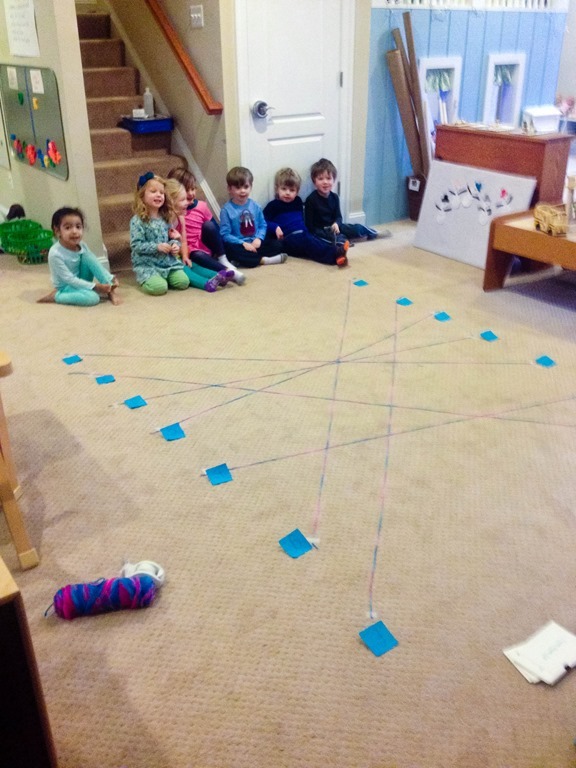 Then each child used a piece of yarn to find the matching lower case letter on the floor. It was like a giant matching game with yarn! 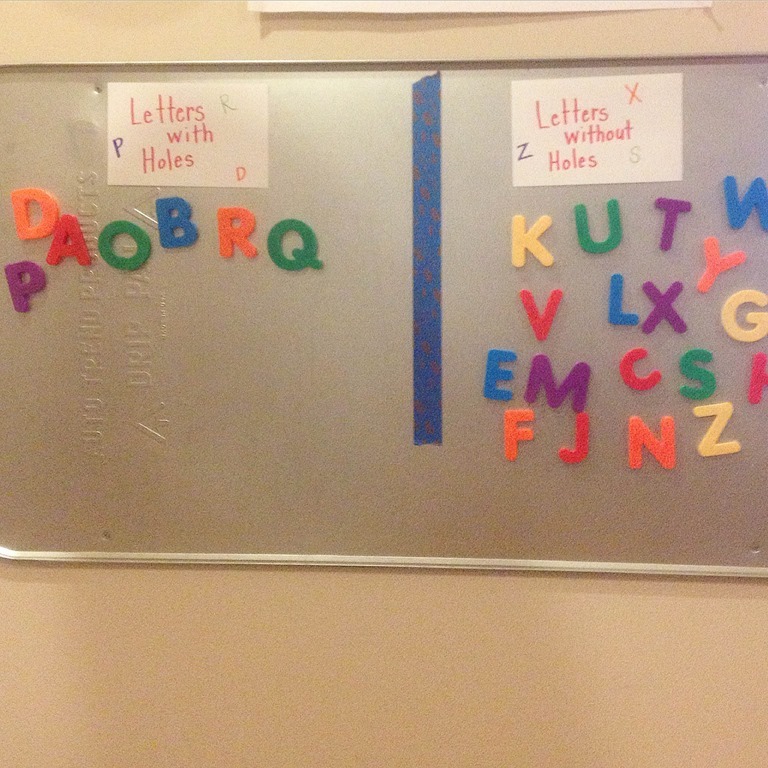 Last week we had a discussion around the magnetic board about our letters. One side of the board was labeled “Letters with Holes” and the other side was labeled “Letters without Holes.” After I modeled a few examples I called on each child to pick a letter and place it in the correct category. This really got the children analyzing the formation of the letters and how they are made. After we completed the activity, I moved all of the letters to the bottom and invited everyone to move the letters around during choice time later that morning. 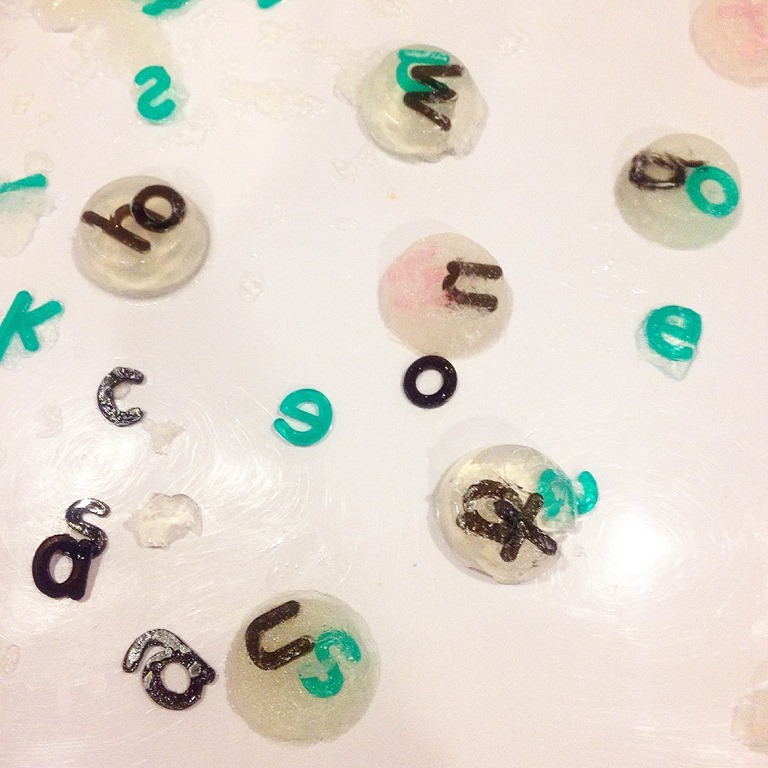 I made a batch of plain gelatin in muffin tins, and hid our transparent letters inside of each muffin container. I popped out all of the gelatin and left it in the art room to explore with kitchen knives. They were really interested in this new texture and freeing the trapped letters. Of course we wrote some of our letters in our learning journals. 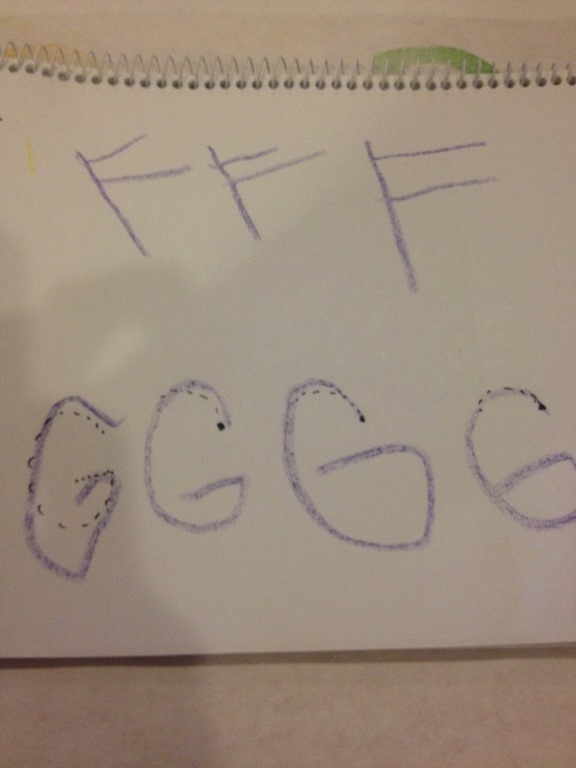 The “F” is much easier to form than the letter “G.” Therefore I gave some starting points and guiding dots to help some of the class with their letter G. They have come a long way, and many of them are displaying such wonderful pencil grip and fine motor control. It must be all of the play dough and tweezers work we have been doing! 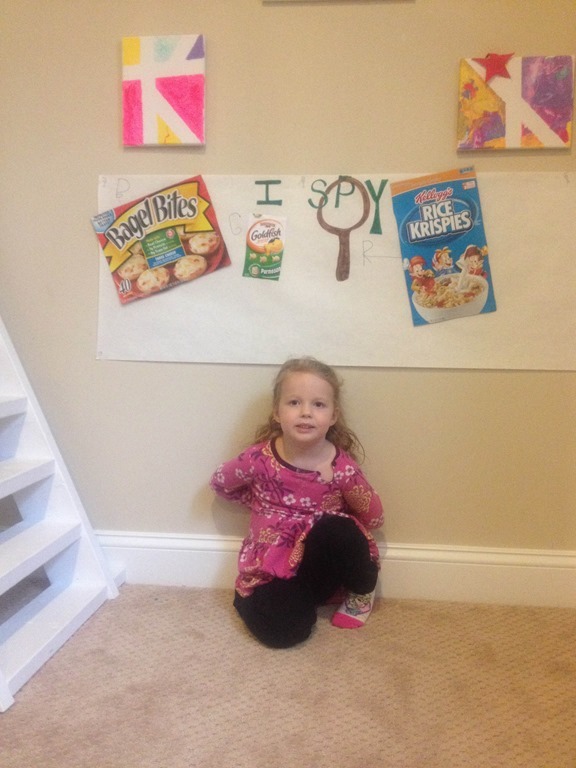 Ellie helped me get our “I Spy” wall hung up. Each child has been bringing in environmental print to share that they have “spied” letters on the cover. 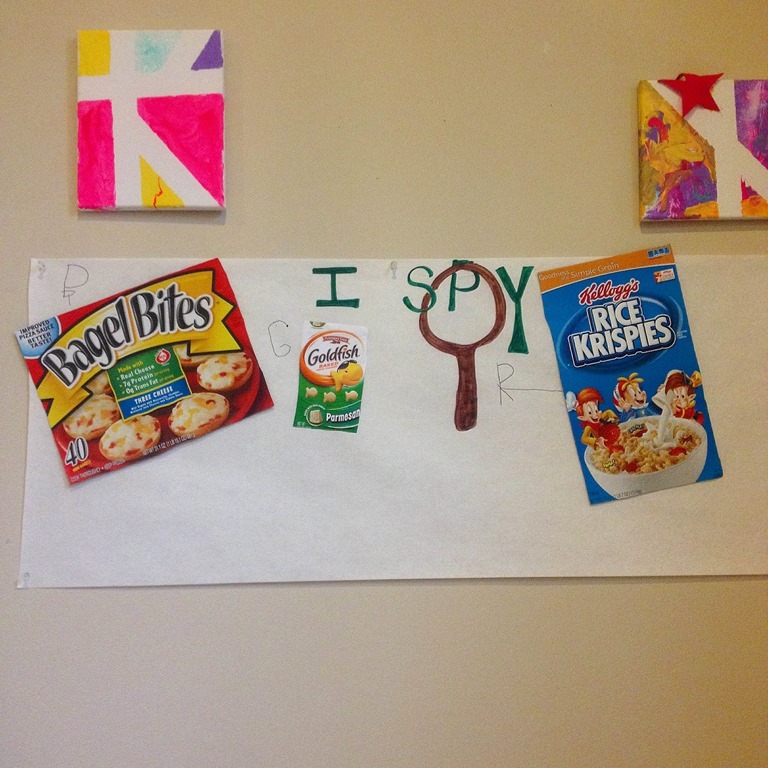 I will share a picture of our completed “I Spy” wall soon. We are back to school, and it has gotten off to a great start! 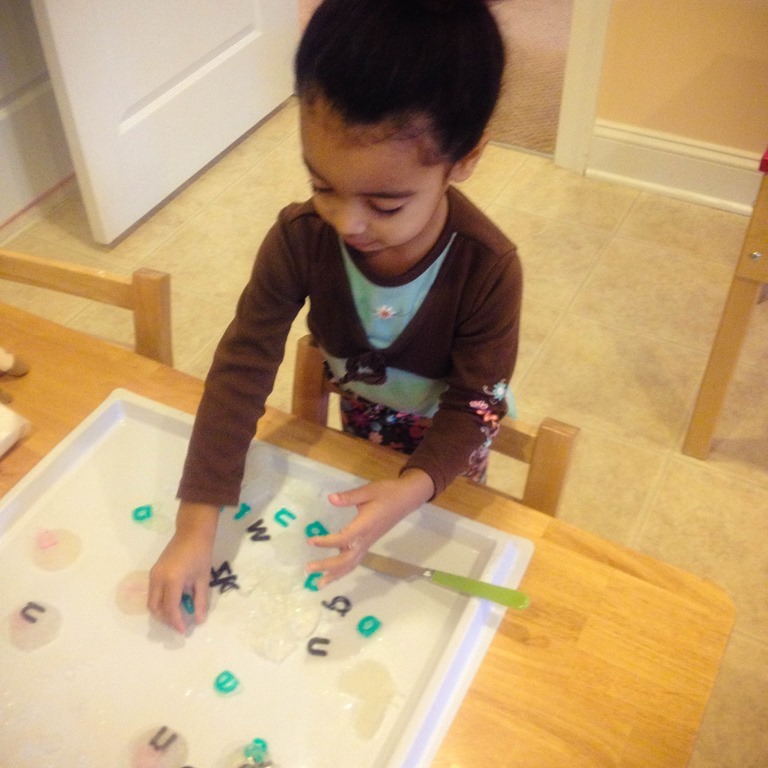 Categories: preschool, preschool literacy | Tags: Early Childhood, emergent literacy, learnning through play, preschool literacy, sensory play | Permalink.